You should not use just any waterbed heater with a flotation softside water bed. These modern fluid beds have less water than the older wood framed waterbeds. Softsiders require a system that won’t over heat and scorch / burn your watermattress and safety liner. With solid state energy efficient control and a max wattage output of only 120 watts this easy to read digital read out will not only save you money but give you peace of mind and safety. This unit is specifically designed to work with your mid fill, shallow fill, or deep fill soft side waterbed. Whether you own a tube or cylinder type softside, single, or dual bladder you will rest easy knowing that your heater’s patented safer design will keep the temperature regulated to a cozy temperature that is exactly where you like it. For more details on this heater look below. 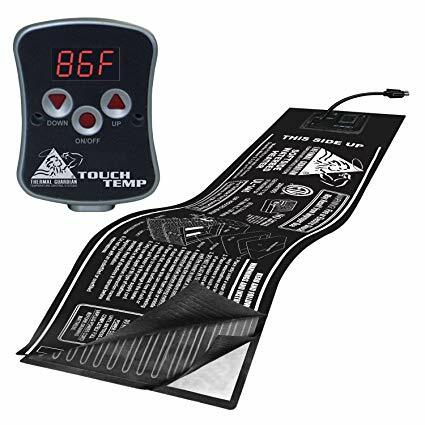 Rest Assured: The safest waterbed heating pad and digital thermostat design. Simple Operation: Follow installation instructions and plug it in. Large illuminated adjustable digital read out. You won’t need your glasses and you can read it in the dark. How will you know if your new heater is working? A illuminated diode indicates that the waterbed heating unit is in the warming mode of operation. 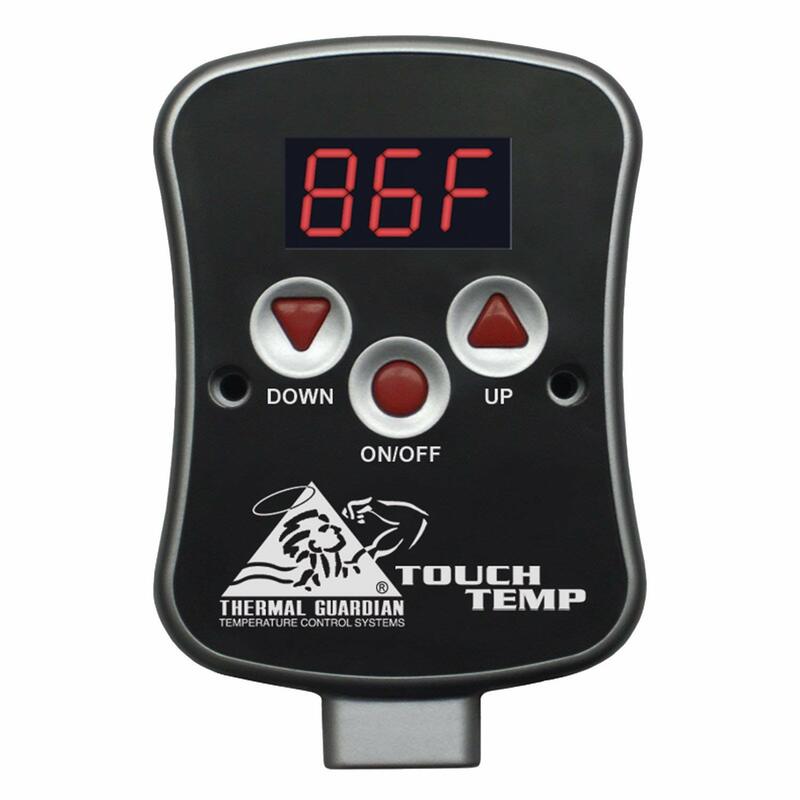 Simply press the arrow button UP OR DOWN to accurately regulate your desired temperature setting. Temperature Selection: Not only will you have the perfect temperature, but your new system will maintain the water temperature within +/- 1¼F, in normal room conditions keeping you comfortable and cozy all through the night for many many years to come. 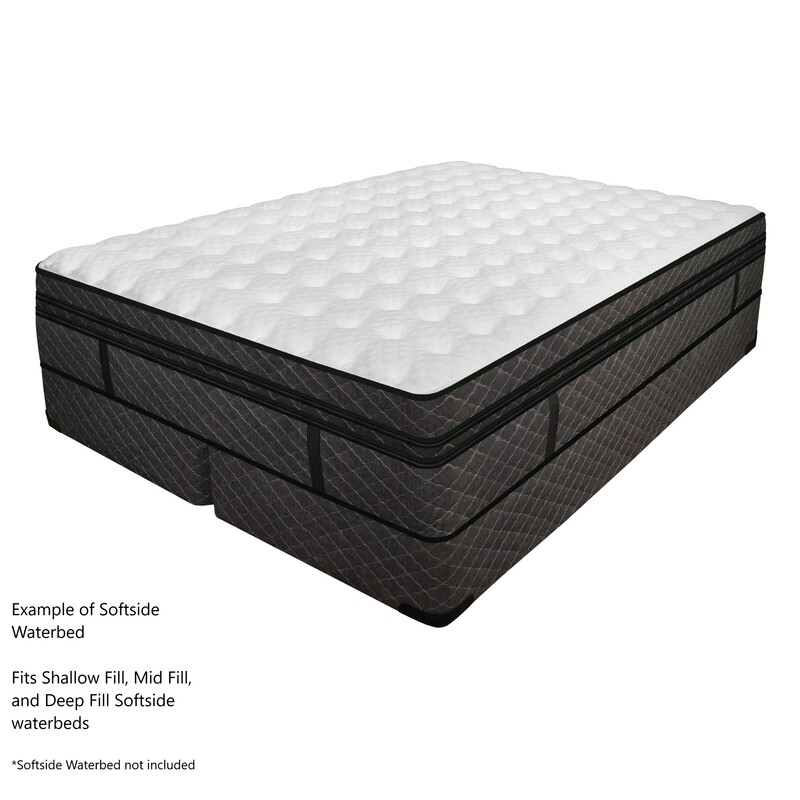 Dual bladder waterbeds: If you have two water mattresses in your one bed this is called a dual bladder. Each of you will need a heater. This will allow for individual temperature regulation an can save a relationship 😉. Example; one side of the bed could be adjusted to 90 degrees, while the other is set at 86 degrees. Perfect when the two of you just can’t same to come to an agreement on the bed temperature. Anti-Flame coating: Take notice of the unique finish and you may see additional brush marks, what you are seeing is a high tech flame barrier used as a final layer for added safety. Safe and Reliable: Offers Patented Circuit Layout for EMF (Electro Magnetic Field). Provides Lower Energy Consumption / Outstanding Temperature Regulation. Resists Electrical Spikes up to 1500V. Wattage: 150 and 285. Longer Safety Liner and Mattress Life: With lower wattage compared to models built 20-30 years ago heating units are safer for many reasons, one of which is that new systems offer better heat distribution over the entire heater pad surface reducing plasticizer migration to maintain suppleness and extending vinyl life on your liner and water mattress. Stops scorching and overheating that damages waterbeds. Heater Warranty: 5 Years Total. You won’t find a better guarantee! 3-5 years prorated cost to replace……..65% of the then Manufacturer Suggested Retail Price. 1-2 years fully repaired or replaced at No Charge. See warranty for the full list of details. 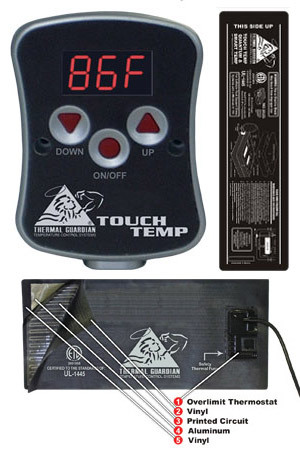 Extremely Accurate: High quality high tech solid state encased thermostat control box. Longer Lasting: That says it all! Easy to Read: Sharp contrast red/black illuminated interface. Wide Variety of Temperature Settings: Nearly 32 comfort settings for your personal preference. Our heaters have been tested for strength and durability. How old is your safety Liner? Over 5 years of age? Check it for common these common problems: Torn, broke down along the sides or corners, is there a hole(s) in it? If you said yes you are in the market to replace your liner. Your will need to consider a new sofside waterbed liner found here. Remember it does what it says. It is a safety liner and is your final and last safety net in the case of a leak and should be swapped out for a new one. Home repair is expensive, liners are not. Do not play Russian Roulette and risk home damage, replace the worn liner. When refilling your water mattress do not forget to exhaust all the air out by burping it. Burping your air pockets out of the water bladder reduces loud and obnoxious sloshing noise and makes the bed more comfy and cozy all night long. Prevent waterbed odor by adding waterbed treatment. Conditioner can be purchased here.